Think about putting gas in your car for a minute. You go to the gas station...pay for the gas...pump the gas...and when you're done you have a full tank. Why is that relevant? 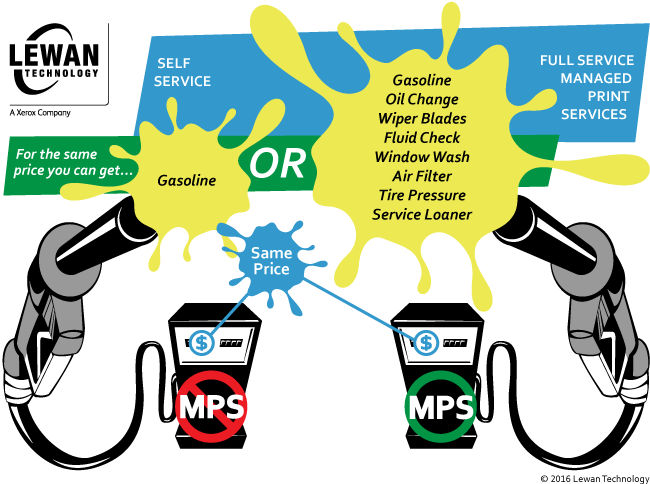 Well, a good way to understand the benefits of managed print services is to compare it to getting gas for your car. Managed Print Services, Print Management Solutions and MPS are terms popping up a lot these days, especially if you’re working with an office printer/copier leasing company. So what is managed print services and what can a print management program do for your business, your end users and the bottom line? "More than 35 million Americans in the workforce did some or all of their work at home in 2014." "Mobile workers will account for nearly three quarters (72%) of the total U.S. workforce by 2020." What does this all mean? Forward-thinking businesses of every size are turning to application delivery and desktop virtualization to reduce IT costs, provide greater mobility and productivity for employees, and to improve data security and compliance.